This page will provide you with everything you need to know on the history of Pembroke Dock Harlequins. Pembroke Dock Harlequins RFC began back in 1880 when around fifth teen men working in Pembroke Dock's Dockyard pulled on their rugby shirts and set up the club with the teams matches being played at the Barrack Hill Ground. Since then the club has survived through some very tough periods including two World Wars and the closure of the town's dockyard leaving us with the fine club we have today. 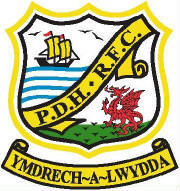 When the club began all those years ago it was called Pembroke Dock Football Club then later Pembroke Dock Rugby Football Club until the early 1900's when the name Pembroke Dock Harlequins was finally established. The Pembroke Dock Quins began playing at the Barrack Hill Ground and many other venues until they made their permanent home the Bierspool Ground in 1956. But the facilities at the ground were very basic with players having to get changed at various pubs and having to walk to the playing field but with help of members and and friends of the club over the years buildings have been added enabling the players to use amenities such as hot showers and clean changing rooms. But all of this may not have been possible if it had not of been for the spirit of the town and members in keeping the club going through two world wars and through the closure of the Quins' main supplier of players the Pembroke Dock Dockyard in 1926. It was five committee members that unanimously voted to keep the club going in the 1927 A.G.M. after the closure of the dockyard and their names were Walter David, Llew James, A. Skerry, Bill Husband and Archie Howell. Over the years the Pembroke Dock Quins has had some great players and some great teams. Some of these players include Ernie Finch and W.J.A Davies who went on to play internationally for their respected home nations of Wales and England. 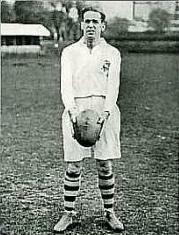 W.J.A Davies even went on to captain England in 1921 at Twickenham against Scotland. The Quins has also hosted some great teams including the mighty Llanelli in the Welsh Cup. This Llanelli team had internationals galore including Phil Bennett, Delme Thomas, J.J. Williams and Derek Quinnel. The Pembroke dock Harlequins Ladies Committee was formed after the Second World War. I played a vital role in helping to finance the purchase the Bierspool Ground by helping out with fundraising including running dances. All of this money went towards purchasing a permanent home for the Quins. When the committee was first set up in was under the chairmanship of Mrs Egerton and included Mrs Dix, Mrs Williams, Mrs Hay, Mrs Lloyd, Mrs Shirlock, Miss Blackmore and Miss Peters. After the Ground was finally purchased and a pavilion was built the ladies now had a new task and this was to provide the players with cups of tea and meals. Thanks to their support and fundraising the Quins rugby club is still going strong and still holding their annual summer carnival.